Welcome to Volume One of my blog paying homage to the football clubs I've visited all over the world and the wonderful people responsible for keeping them going and their maintenance. Everlasting thanks primarily to my late and very much missed and dearly loved parents; my Dad, Bob Bernard and my Mum; Ann, who put up with endless years of football chat and my brothers Nick and Paul who gave me the chance and encouragement to do what I have. Thanks to all my friends who offer encouragement and Sally and Stan who inspire and give me great pride. Stan is showing a keen interest in my hobby as he grows into a young man! Click to see Volume Two of HAOTW. Ratchaburi FC is a football club based in the Thai city of the same name, which is located approximately seventy five miles south westerly from Bangkok. ‘The Dragons’ were formed in 2004. The club started out life in the third tier Regional Leagues with little success, before they won promotion from the Central-East Division in 2011. The success continued as Ratchaburi won the Division One title at the first attempt. To add to the triumph Ratchaburi also reached the final of the League Cup, but ended up losing 4-1 to Buriram United in farcical circumstances. 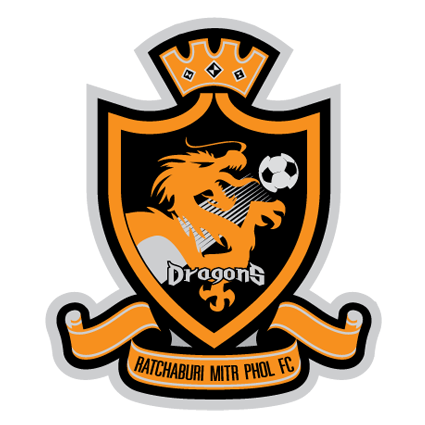 Ratchaburi had several players on loan from United who were then unable to appear in the showpiece, meaning that The Dragons were unable to name any substitutes. In their debut season in the Thai Premier League, The Dragons struggled as they finished the season in fifteenth place under Spanish manager Ivan Palanco. However, once again they reached the League Cup Final at Tammasat Stadium against Buriram United yet again. This time United came from a goal down to break The Dragons hearts with a 2-1 victory. In 2016 the club moved from Ratchaburi Stadium a few miles west outside the city to the village of Huai Phai to the brand new purpose built Mitr Pohl Stadium, which was owned by the club. The 2016 campaign saw the team finish in sixth place and were announced as joint winners of the FA Cup along with three other semi-finalists as the season was truncated owing to the sad death of King Bhumibol Adulyadej. Brazilian striker Heberty finished as top scorer for a third successive season. Marcel Essombé topped the scoring charts in 2017 as Ratchaburi finished in sixth place once again, under head coach Pacheta. The Spaniard was replaced by former German international Christian Ziege for the 2018 season. However, he lasted just one month before being replaced by René Desaeyere. The team finished in twelfth position with Kang Soo-il top scoring with Tunisian coach Lassaad Chabbi in charge before his departure. Ratchaburi Mitr Phol FC will play in the Thai League 1 in the 2019 season. It is fair to say that despite having a decent knowledge of football in ‘The Land of Smiles’, I was short on knowledge on Ratchaburi as a football club, or indeed the city. A visit wasn’t anywhere near my radar when I set out on my great two week adventure, but like many times before I grabbed an opportunity when it was going begging. My chance came about after staying in Samut Songkhram and wanting to return to Hua Hin as I’d enjoyed my three days there the previous week so much. My research told me that it was possible to catch a train to the resort if I somehow got to Ratchaburi. This was solved by way of a bus ride from Sam Song. Even the bus ride was fascinating as we drove along a highway familiar to me before we went straight on rather than heading south like the Hua Hin bus does. It was new scenery for me to take in. The fare was 25BHT and for that we were treated to a Thai drama on the TV over the drivers seat. I hadn’t a clue what was happening on the screen, but it followed the usual pattern. Girl finds boy and falls in love, before they fall out and eventually make up with some storyline around it. What impressed me most was that it ended at exactly the same time as we entered Ratchaburi. Was this perfect timing from our driver, or had he delayed our journey so the few passengers remotely interested saw the end? I will never know. Anyway, I had sketched out a rough route to the stadium from where I thought the bus station was. It’s strange how the simplest of walks on Google Earth turn into a logistical nightmare once in real life. In short, I got lost. Salvation was at hand with a large tourist map at the side of a busy street. A young local astutely saw my expression and offered assistance. Before long I was traipsing down the hot streets getting nearer my target. My luggage consisted of a rucksack on my back and my laptop bag on my front. It was tiring work, but I would not be beaten. Street cafes lay outside the grounds of Ratchaburi Stadium, which also had other facilities as well as the main arena. Just as I was going in I was passed by a couple of double decker coaches, which were carrying Dragons supporters back from their teams 1-0 defeat at Chiang Rai United the previous evening. It was now gone 1pm the next day. Despite this, the young colourful fans seemed in reasonable spirits. It also gave me hope of access inside the stadium. I was struggling until I saw a club official. He kindly took me upstairs and opened a door through into the VIP area as well as taking my photo. Ratchaburi Stadium was like many other football venues in Thailand in that it had a running track surrounding the pitch. The vast majority was open large steps, which fans usually sat on and one covered stand down the side with a few proper seats in the VIP area. All the steps were painted in the teams colour of orange, which gave it a nice look. I thanked my new friend and walked round where many fans were being picked up to go home before really chancing my arm in the aid of saving time and energy. Opposite the stadium was the city’s main hospital. Behind it was the road to the railway station. To go all the way round would have taken quite some time, so I decided to walk through the hospital grounds in the hope that there was an exit on the other side. After much smiling and “sawasdee’s” my punt paid off and I was heading down to the station. I saw a couple of lovely places that I noted for refreshments if I had a wait. As I went into the booking office, the clerk serving asked where I was going? When I replied “Hua Hin” he ushered me up and sold me my ticket for 23BHT (about 60p) and told me that the train was arriving in a couple of minutes! The journey was another joy despite the train being packed as locals walked up and down the carriages selling their wares. It was certainly cheaper than back home and it made a refreshing change. I’d had another brilliant day and my luck was well and truly in!